Looking for the right Survey Junkie review that not only tells you the real facts and truths but also exactly how you can make more money than normal from it? If yes, then this is the right article for you. So, yes, when it comes to really sites that pay people for sharing their thoughts and opinions and taking surveys, Survey Junkie is high up the list of genuine paid survey sites that really pay. Unlike many other survey sites out there that basically waste your time and don’t really pay, Survey Junkie does pay. They have actually paid millions of dollars over the years to millions of members like you. Members will be paid to complete surveys, share their thoughts and opinions and perform other simple tasks. Click here to join Survey Junkie and start earning today or keep reading to find out more about Survey Junkie. In particular you will learn about a staggering 27 important facts and truths about this “Get Paid to Take Surveys” company. 4 – Registration is 100% Free! Click here to join Survey Junkie and start earning like others are! Found This Review Helpful? Please Share It! Survey Junkie is an online survey website that specializes in paying members or users cash for taking or completing online surveys. It was established in 2010 by “Blue Media Ventures, Inc.” a company based in Glendale, California. It first started as a lead generation site for other partner survey sites or panels but has moved up since then. When they started they matched members with other sites that offer “get paid to take surveys” and rewarded for completing tasks. For instance, they provided members with information and links to complete surveys from partner survey panels like Toluna, Ipsos I-Say, Harris Poll Online, MySurvey, and SurveySpot. They have since moved up from there and now run their own surveys as an online survey and market research company. They now have 10 million members and they really pay. Survey Junkie is easy to use and has many positive reviews from users. Survey Junkie is a “get paid to take surveys” company. This means you can actually get paid with cash after completing a survey. The process of earning from this site is simple. Your points can be exchanged for cash or gift cards. You can cash out via PayPal when you reach 1000 points or $10. Click here to join Survey Junkie! Survey Junkie is now a full blown platform where you can sign up to get paid for taking surveys. They didn’t start this way though. They started as an online lead generation platform where surveys taken were from other partner sites. Members back then were redirected to partner survey panels like Toluna, My Survey and Ipsos I-say to complete surveys matched with their background information. Back then, even though Survey Junkie processed and paid members for the tasks completed, they were actually an online jobs or lead generation platform, getting leads for clients or partners. As of 2017, Survey Junkie had served more than six million surveys to members. In other words, since it was launched in 2010, members have earned cash from more than six million online surveys issued by this company. That goes to show that not only can they be trusted, they have been in the business of offering surveys for many years. And the over six million surveys they have done show they can be trusted to pay as well. The fact that this company has been operating since 2010 and is still operating now is mainly because it’s safe to work with them. If they were unsafe to work with they would have gone out of business long ago. So, you most certainly don’t have to worry about getting hacked, scammed or spammed to death when taking surveys with them. Unlike survey companies that spring up today and are gone tomorrow, Survey Junkie has been there for many years because they are really safe to use and they really pay. You don’t have to pay any amount to apply or register with Survey Junkie. It is 100% FREE and this is pretty cool. You only need to fill out your email, create a password and provide all other background or registration information. This is one of the most important criteria for knowing a genuine survey site. You shouldn’t be expected to pay to help them provide feedback for brands and companies. Any company requiring payments for surveys is most likely trying to scam you. That’s why all the envelope stuffing programs out there are scam. They are usually in the business of getting people to “pay for registration” or “pay for more information”. Survey Junkie is not in such scammy business. They get paid by brands and companies who want feedback from everyday people like you and I.
It’s from the money they get paid by these brands and companies for feedback that they pay to YOU. You join completely free and they help you make money, even from the first day. You will make money doing surveys with Survey Junkie, but you certainly won’t get rich from the process. This is because the money you make won’t be enough to get rich on. So, don’t believe anyone who tells you that it’s possible to make hundreds of dollars or thousands of dollars per day doing surveys. Anyone telling you that is only trying to get something from you. Yes, you can learn how to make money fast from these surveys but it won’t be thousands of dollars fast! Instead, consider what you earn from them as extra side income, not a way to get rich. Unless of course you have concrete plans of using the money you earn from Survey Junkie to fund other ventures that can make you rich. If that’s not the case, then no – you can’t get rich just from the money you get doing surveys – whether with Survey Junkie or any other paid online survey company. 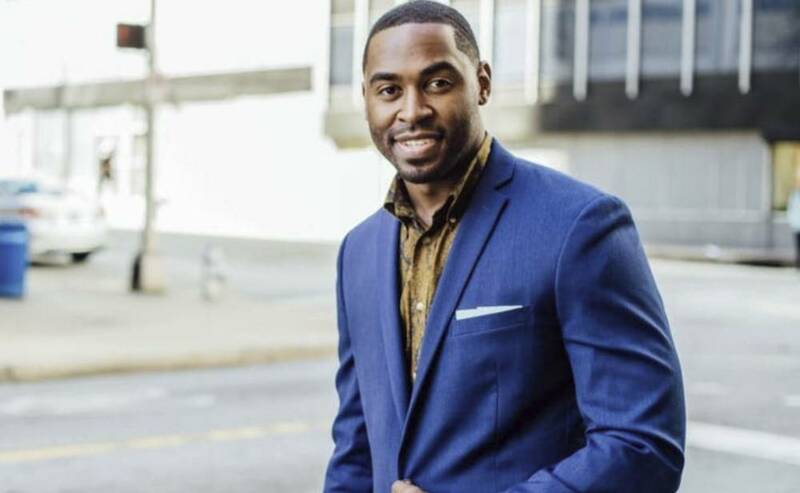 Despite that though, you can definitely make hundreds of dollars per month doing surveys with Survey Junkie, as you can see from the rest of this article. Yes, on the average, users can earn $1-$3 per survey. Do the math and you will see it’s possible to make about $30 a day if you can complete about 10 surveys. This equals to $300 per month. However, this will depend on the types of surveys you decide to take. The good news is that there are always many surveys to qualify for with Survey Junkie. Apart from providing members with online survey questions, Survey Junkie also pays members who participate in its focus group discussions. Panelist that qualify for Survey Junkie’s paid online focus groups can earn up to $120 per hour. That’s where the big bucks usually is working with Survey Junkie. And no, it’s not impossible to get these types of gigs. It’s just a matter of eligibility and whether or not you qualify. And qualifying for as many surveys and focus groups discussions as possible with Survey Junkie starts with providing as much information about yourself as you can, so they can match you with the right ones. That’s why when you join Survey Junkie, you should take the time to not only confirm your email, but also fill out your profile with detailed and relevant information about yourself. They can’t get you such high paying focus groups discussions gigs if they don’t know enough about you. Yes, you can really make money daily with Survey Junkie because they are legitimate! To prove their legitimacy they have countless positive reviews from members who actually get paid for completing surveys and sharing their thoughts and opinions. With the more than 10 million members, it’s pretty convincing it’s a legitimate site. 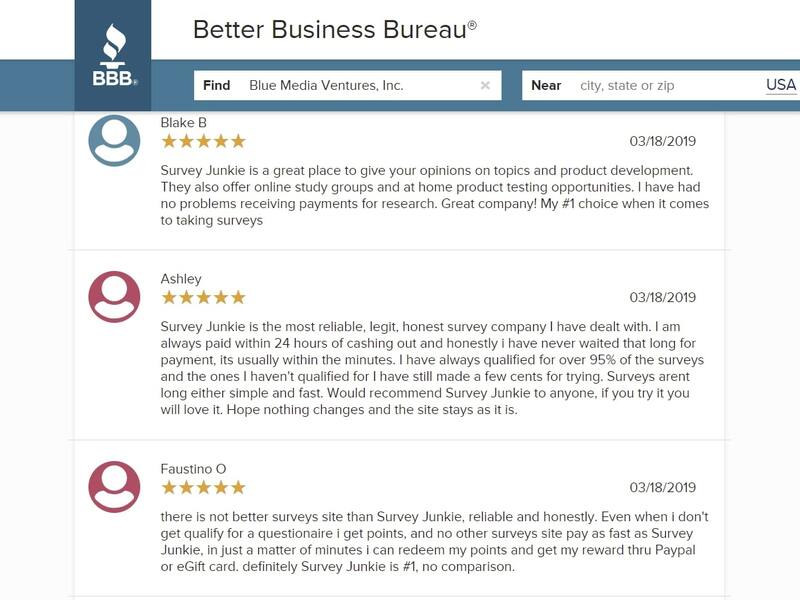 The Better Business Bureau (BBB) has given Survey Junkie an A+ rating. Although there have been some complaints about this survey site, the BBB has made its ratings based on how responsive they are to member’s complaints. Survey Junkie has had a BBB accreditation since 06/29/2017. Launched in 2010, Survey Junkie currently has with over 10 million members, with many thousands joining every single day. This ensures trust and legitimacy. It’s very hard to have these many members if a company is a scam. Unfortunately not every one can join Survey Junkie. For now only online members from the US, Canada and Australia are allowed to become members. Those living outside of these four countries are not allowed to sign up to Survey Junkie. They previously allowed members from the UK, but not any longer. Of course they are likely to add more countries that they allow members from, but for now only from US, Canada and Australia. Yes, you can be 13 years of age or older to join this survey company. This still makes it better than others that only allow members who are 18 years or older. That’s why this is one of the ways for kids to make money, since 13 year olds are still generally considered kids. And yes, brands and companies also want to hear what kids have to say about their products and services… and are ready to pay! With the billions of kids in the world today, brands and companies are making a lot of money creating products for them. The more feedback they get from kids through online surveys and even market researches, the better the products they can make for them. You earn points and not cash when you complete tasks with Survey Junkie. However, your points can be converted into PayPal cash or you can get free gift cards. It’s all up to you what method of payout you prefer. Each point is 25 cents ($0.25). The threshold of 1000 points, which is equivalent to $10.00, is what you need to cash out. As you can see, it’s very easy to add up many points with Survey Junkie! Survey Junkie provides surveys to members that are qualified. You qualify for specific surveys based on your demographic. There is always a high chance of you getting the right surveys that you are qualified for because you already are pre-selected. It must be noted that where you are disqualified in the middle of a survey, Survey Junkie will still reward you with points for your efforts. They are among the only few survey sites that really still rewards members for points even if they get disqualified in the middle of surveys. This ensures you don’t waste time for attempting any survey. Click here to join Survey Junkie and start earning today! You have various options to redeem your points when you take surveys through Survey Junkie. You can redeem your points as cash or e-gifts. It is important to note that this “get paid to take surveys” company doesn’t charge fees for redeeming points like other fraudulent survey sites might. So, whether you are redeeming your points for cash via PayPal or for gift cards from top retailers, the process is free and easy. Also See: Get Paid To Watch Videos (and genuine companies that really pay). If you want to start making money with a “get paid to take surveys” company online then you should choose a company with a large inventory of surveys. Survey Junkie partners with so many brands and companies that they can easily provide you with access to many surveys at a time. The more surveys you have access to every time, the easier it is for you to make more money. Survey Junkie’s website is well-designed so that users can easily navigate and take advantage of the various features. The website has many sections that make it easy for you to take surveys, earn rewards and get paid. Indeed, the website is attractive and professional looking. With Survey Junkie, you get to receive automatic points. There is no delay and if you have enough points you can cash out right away. Unlike some websites that delay delivering the rewards, this is not the case with Survey Junkie. You receive your points automatically right there and then, allowing you to cash out whenever necessary. With most of other “get paid to take surveys” companies you may have to deal with regular phone calls from their marketers or even others they share your data with. This could be very frustrating and annoying. However with Survey Junkie, only your name and email address are required to create an account. You don’t have to provide other private personal details including your phone number to become a Survey Junkie member. You will discover that new daily surveys are added with Survey Junkie, making it possible to always find one or more surveys to complete. Their surveys are constantly updated. If you don’t find surveys you qualify for, then you can come back later for fresh updates. You are definitely not short of fresh surveys with this company. Click here to join Survey Junkie For FREE! Survey Junkie makes it easy for members to qualify for surveys. They provide tips to help you, from the first day you become a member and continually afterwards. They also advise that you be honest, consistent and don’t answer too quickly to qualify for surveys. If you keep these tips and advice to heart, you will surely qualify for many surveys and make good money on a daily basis. There is a minimum cash out or withdrawal from your Survey Junkie account. If you have accumulated or earned up to 1,000 points, which is equivalent to $10, then you can ask to withdraw cash to your PayPal. Talking about PayPal, it’s like getting free PayPal money since you don’t have to spend any money to get paid. Although the $10 can be considered by some as a high minimum threshold, it is still better than some other rewards site which have minimal withdrawal balances of around $25. Thankfully it’s not that hard to get 1,000 points if you put time aside to work with this. Survey Junkie operates with a comprehensive points system. This means that every task earns the user points. Points can be converted to cash payout or gift cards. Cash payments are basically made by PayPal, making it one of the ways to make money with PayPal. You can also exchange your points and get free Google play gift cards to use with top retailers. You can access and complete Survey Junkie surveys and tasks on multiple devices. You can choose to complete tasks on laptops or on mobile devices. More so, there are also mobile-only surveys that can only be filled out with your smartphone. The Survey Junkie smartphone app is one of the best money making apps out there and can be installed on your iOS or Android device. As a member of Survey Junkie, you will earn with simple steps, rather than complicated steps as is the case with other survey sites. These simple steps may include easily creating an account, completing your profile, taking surveys to earn points and cashing out your points in the form of cash or gift cards. The steps are easy and you don’t need any special training to accomplish them. One of the common complaints about Survey Junkie is too many spam type emails. This really shouldn’t be that much of a problem because you can prevent this by simply changing your account settings to deal with how much mail is delivered to you. More so, it must be noted that Survey Junkie has responded to these complaints and most members are no longer complaining of spam emails. There are high complaints of account closures from users. It is possible that the terms and conditions had been violated and the accounts were closed. It is important that you understand why accounts could be closed or deleted to prevent this from happening to you. Thankfully they provide you with all their terms and conditions when you sign up. Make sure you read the important ones, to know what you should do or not do, to remain a member. As you have seen from this article, Survey Junkie is a “get paid to take surveys” company you can trust. You can join them completely free today and immediately start earning money. Click the above image or click here to join Survey Junkie and start earning today! This review presents you with as many as 27 facts and truths about Survey Junkie showing why it can be trusted. It also shows you how Survey Junkie has been in business since 2010 and currently has over 10 million members. Most importantly, it shows you how Survey Junkie has really paid millions of members over the years and continues to pay, every single day. You can be one of the members getting paid daily, when you join completely free today.